For years, Michael Bassis heard from executives who were not that happy with graduates from traditional master’s of business administration programs. Fresh MBAs knew business concepts, but not how to use them, nor did they possess many of the “soft” skills that go into leading a business, such as communication. At the same time, however, the costs of earning the degree have gone through the roof, leaving many families wondering whether they were getting much value. The experiment yielded its first harvest this summer. In partnership with Donghua University in Shanghai, Westminster graduates its first cohort of 10 Chinese MBA students Saturday, two months after it awarded MBA degrees to 37 graduates through the project-based program on its Utah campus. “Evidence suggests the program is working better than we ever hoped. Students are taking a greater sense of ownership in their learning. 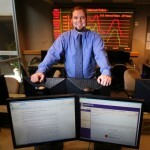 Faculty are clear that learning has increased dramatically,” Bassis said from China in an interactive webcast on Friday. And the model costs less because it frees faculty from the lecture podium and testing to instead coach students. Project-based learning has drawn plaudits in the forthcoming book The Innovative University: Changing the DNA of Higher Education from the Inside Out, co-written by Clayton Christensen, a Harvard business scholar famous for his theories about “disruptive” technologies. The co-author is Henry J. Eyring, vice president for academics at Brigham Young University Idaho. The “experiential” concepts behind the new Westminster initiative can also be seen in other programs, such as The Foundry at the University of Utah and the Huntsman Scholars program at Utah State University. But Westminster has gone furthest, liberating an entire master’s program from the classroom. Student Chris Hoffman bailed on his work toward a master’s degree of professional communications to sign up for the project-based MBA program last year. In his traditional program, he had to take Web design courses even though he had been building sites for 12 years. There was no option to demonstrate proficiency and move on, as is the case in the new program. “The first thing I like is the flexibility. I get to spend time with my family because I don’t have to carve out times every week to be in class. The second thing is it’s so practical. Everything I learn I can bring into my work to apply the next day,” said Hoffman, who works as information manager for Westminster’s Division of New Learning. Westminster separately continues to run Utah’s largest traditional MBA program, which awarded 133 degrees this year. The project-based program is geared toward working students who already have business experience. Executives at one Utah business who sent several junior employees through the program are pleased with their progress, according to Aric Krause, a Westminster business professor who serves as dean over the college’s Division of New Learning. Several other students started businesses while in the program. The program spans five semesters, each framed around a “residency,” a two-day seminar with professors. Graduates complete 25 projects that require tasks such as market analysis, financial analysis and formulating strategies. “It’s no longer a ‘Cs-get-degrees’ mentality where you cram all this information. It applies practically to what you do in the work place,” said student Joe Romney, a quality-assurance specialist at Morgan Stanley. Students proceed at their own pace and have online access to project materials. Romney, who has two small children at home, said he sometimes had Google chats with his professors at 11 p.m. The private Salt Lake City school is developing a ‘project-based’ approach to teaching graduate-level business administration in a move to cut costs and improve learning outcomes. Its new program graduated its first MBAs this year.